The Congress on Friday appointed Ashok Gehlot Rajasthan next chief minister and Sachin Pilot his deputy. A Congress delegation will meet Rajasthan Governor Kalyan Singh in Jaipur at 7 pm today. Rahul Gandhi picked Ashok Gehlot as Chief Minister and Sachin Pilot to be Deputy CM. Rajasthan Election 2018 Results LIVE Updates: The Congress on Friday appointed Ashok Gehlot Rajasthan next chief minister and Sachin Pilot his deputy. The decision ended the suspense over who would be appointed CM of the state. Informing about the decision, KC Venugopal said that the decision was taken after consultation with the various leaders and legislators. After the announcement, Gehlot thanked Rahul Gandhi for giving him the opportunity to serve the people of Rajasthan for the third time. He was the chief minister of Rajasthan from 1998 to 2003 and again from 2008 to 2013. A Congress delegation will meet Rajasthan Governor Kalyan Singh in Jaipur at 7 pm today. 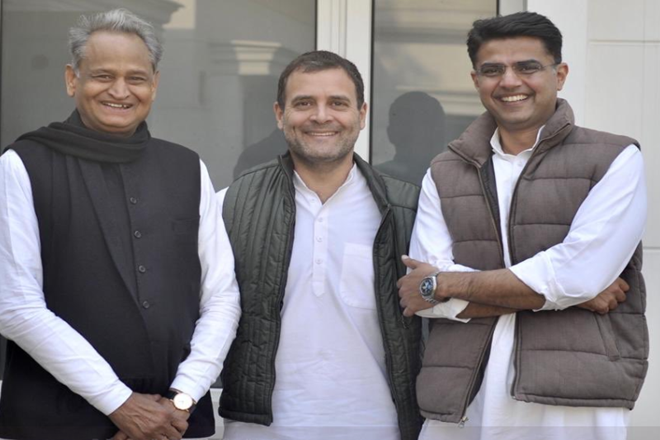 Earlier, the Congress president tweeted a picture with Pilot and Gehlot and captioned it “United colours of Rajasthan”. He appeared to have brokered a truce between the warring factions of Ashok Gehlot and Sachin Pilot. Sachin Pilot and Ashok Gehlot were unwilling to cede ground in Rajasthan over the Congress party’s chief ministerial pick. Interestingly, several first-time winners along with veteran leaders such as Master Bhanwarlal Meghwal and Jitendra Singh were supporting Pilot while Gehlot’s supporters were mostly seasoned legislators who have also been part of his government in the past. The impasse over the selection of the Chief Minister of Rajasthan continued over 72 hours after the Congress emerged as the primary contender to form a government in the state. 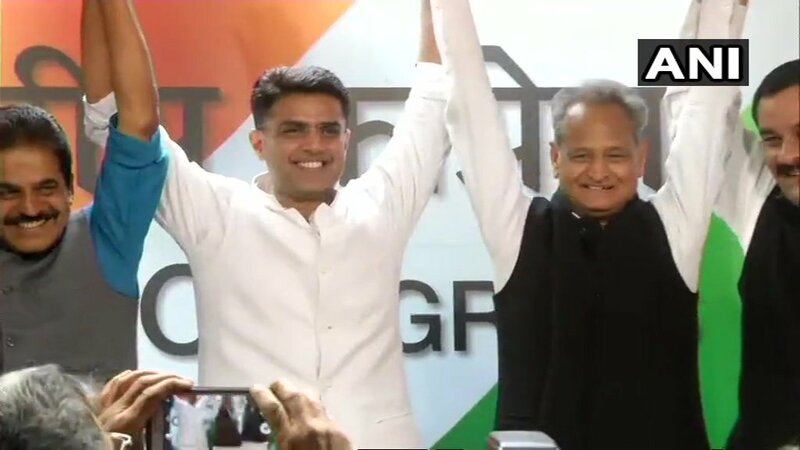 Three days after the results were announced, both Ashok Gehlot and Sachin Pilot flexing their muscle to take the top spot. Ashok Gehlot is a seasoned politician who has won a series of elections from the state and headed the Rajasthan Pradesh Congress Committee four times. He has occupied the office of the chief minister two times — from 1998 to 2003 and again from 2008 to 2013. Gehlot was NSUI's Rajasthan president from 1974 to 1979. He later became the Jodhpur City Congress Committee president in 1979. The CM-Designate was first elected to the Parliament in 1980. He was elected to the Lok Sabha four more times. The Congress delegation will meet Rajasthan Governor Kalyan Singh in Jaipur at 7 pm today. Ashok Gehlot has been appointed as CM and Sachin Pilot will be Deputy CM. The celebrations have begun outside Rajasthan Chief Minister-Designate Ashok Gehlot's residence in Jaipur. 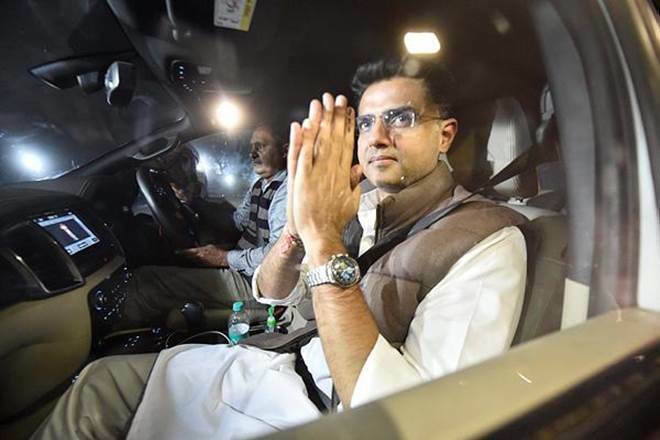 After the announcement, Rajasthan Deputy Chief Minister-designate Sachin Pilot thanked Congress President Rahul Gandhi and other legislators for taking this decision to make Ashok Gehlot the Chief Minister of Rajasthan. The Congress has Sachin Pilot appointed Deputy CM of Rajasthan. The decision was taken by Rahul Gandhi after both the leaders refused to cede ground. The Congress on Friday named Ashok Gehlot as the next chief minister of Rajasthan and Sachin Pilot to be his deputy. Informing about the decision, KC Venugopal said that the decision was taken after consultation with the various leaders and legislators. Ashok Gehlot has the support of seasoned legislators who have also been part of his government in the past. Several rebel leaders who were earlier with the Congress have extended their support on the condition that Gehlot is made CM. 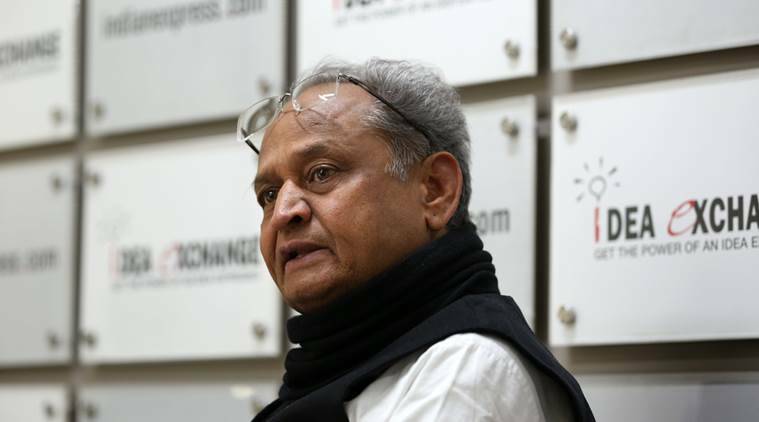 Ashok Gehlot to be next Rajasthan CM? Ashok Gehlot is likely to be the next chief minister of Rajasthan, ANI reports citing sources. Congress President Rahul Gandhi has reportedly offered CM post to Gehlot and deputy to Sachin Pilot. Sachin Pilot vs Ashok Gehlot: Who will Rahul Gandhi pick? Congress President Rahul Gandhi is yet to make an announcement on Rajasthan CM. He has to choose between Ashok Gehlot and Sachin Pilot. The reports suggest that the leadership has decided to name Ashok Gehlot as CM and Sachin Pilot as his deputy. A formal announcement is awaited. On counting day, Sachin Pilot and Ashok Gehlot remained tight-lipped about their candidature as the next chief minister. The duo said that a decision about the CM's face will be taken by Congres president Rahul Gandhi. The Congress has won 99 seats in 200 chairs House. However, elections were held for 199 seats. In 2013 Assembly polls, the Congress under then CM Ashok Gehlot, had managed 33.07% votes but only 21 seats, compared to the BJP’s 45.17% and 163 seats. In this election, the Congress had a pre-poll alliance on five seats with RLD (two seats), Sharad Yadav’s Loktantrik Janata Dal (two) and NCP (one). Only Subhash Garg of RLD won from Bharatpur. The Congress is maintaining that alliances were stitched with 2019 Lok Sabha in mind. As the fate for Rajasthan's CM is being decided inside Rahul Gandhi's, there was sloganeering in favour of Pilot by some of his supporters outside Congress president's residence when the meeting took place., news agency PTI reported. Moreover, sources said the issue would be resolved Friday itself and the announcement would be made at the Congress Legislature Party meeting. A delegation of senior party leaders, including state Congress president Sachin Pilot and former Rajasthan CM Ashok Gehlot, met Governor Kalyan Singh on Wednesday evening to stake claim to form the government, a day after the Congress emerged as the single largest party in Rajasthan with 99 seats. Rebel legislators also met Gehlot on Wednesday and extended their support. “I am ready to lend my support to the Congress on the condition that Gehlot is made the chief minister, said said Ramkesh Meena, Gangapur MLA. Also, BSP chief Mayawati, with six legislators in Rajasthan, had extended said her support to the Congress. Congress president Rahul Gandhi on Thursday held several meetings with observers and probable contenders such as Sachin Pilot and Ashok Gehlot but the decision could not be taken. Former chief minister Ashok Gehlot is the frontrunner for the post.On Wednesday, the newly elected MLAs passed a resolution urging Rahul Gandhi to take a final call on the name who will become the Rajasthan Chief Minister. 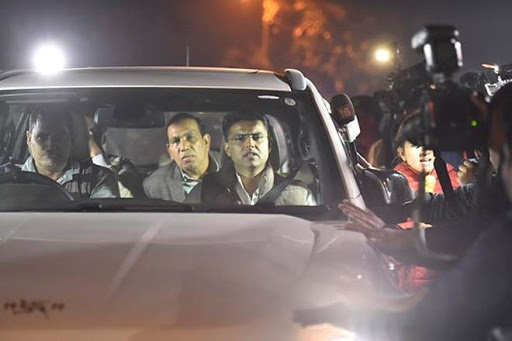 Ashok Gehlot and Sachin Pilot were the top contenders for the post.On Tuesday, AICC general secretary in charge of the state Avinash Pande and party observer KC Venugopal met the MLAs and late evening left for Delhi. 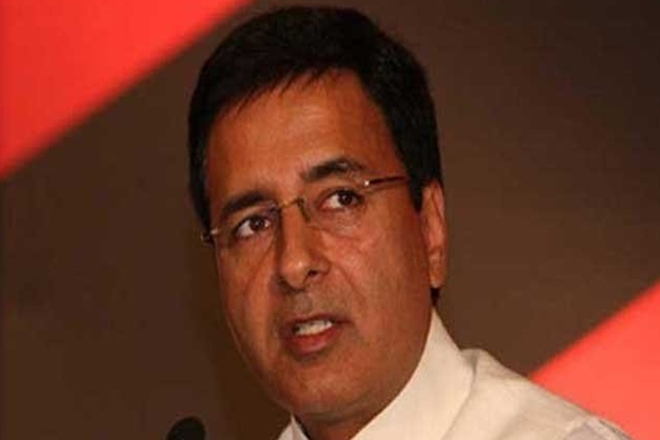 Congress chief spokesperson Randeep Surjewala, when asked about the differences within the Rajasthan unit, denied it and said a due process of consultation was on. "There is no dispute or difference within the Congress units on chief minister's post in Rajasthan and Chhattisgarh," he told reporters. "Be it Rajasthan or Chhattisgarh, a due process of discussions is on among the leaders so that we can form a good government. Madhya Pradesh has been decided and chief minister's issue will be decided for Rajasthan and Chhattisgarh in a day or two also," he said. Congress chief spokesperson Randeep Surjewala, when asked about the differences within the Rajasthan unit, denied it and said a due process of consultation was on. 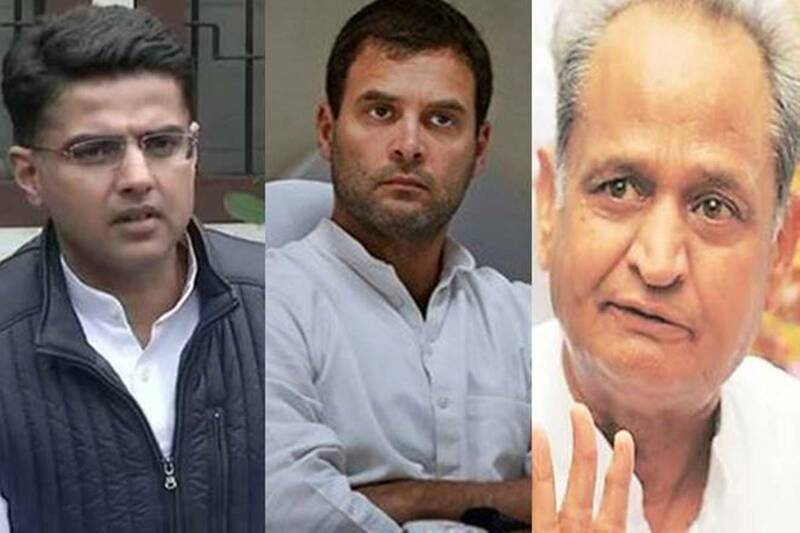 After several rounds of discussions on selecting the Rajasthan CM, top contenders for the post, Ashok Gehlot and Sachin Pilot, reached the residence of party chief Rahul Gandhi on Friday for a final settlement on the issue, news agency PTI reported. Sources said former Union minister and party leader from Rajasthan Jitendra Singh met Pilot earlier in the day and then met Gandhi. Party's central observer for Rajasthan K C Venugopal and AICC general secretary in-charge of party affairs in the state Avinash Pande were also present at Gandhi's residence during the discussions. Sachin Pilot vs Ashok Gehlot - WIll Rahul choose youth over experience? Pilot fits well into Rahul Gandhi’s objective of reaching out to the youth. Pilot took over as Rajasthan Congress president five years ago and led the party from the front in taking on the BJP government over various issues. Under his command, the party won a series of bye-elections, and subsequently won the current assembly elections. However, even though the two-time Lok Sabha MP was a minister in the UPA government, party leaders say that Pilot's administrative skills are yet to be tested fully and do not compare with Ashok Gehlot’s proven record. WHat makes the decision tough for Rahul Gandhi is the impact it could have on the 2019 Lok Sabha elections. Rahul's choice of CM will have consequences for the Lok Sabha electios next year. Considering the fact that the government’s survival will depend on independents and smaller parties, it is viewed that experience will matter. Caste factor is also an important political parameter in Rajasthan and Pilot, who hails from the Gujjar community could prove to be a disadvantage in the Lok Sabha elections given the Gujjar-Meena divide in the state. On the other hand, the Congress party had to face defeat when Gehlot led the party in two previous campaigns, the last being in 2013, when the Congress could win only 21 seats. Also, his name was linked to alleged housing and land allotment scams. In his favour, Gehlot is considered as an organisation man. He is a five-time MP and two-time chief minister of Rajasthan. 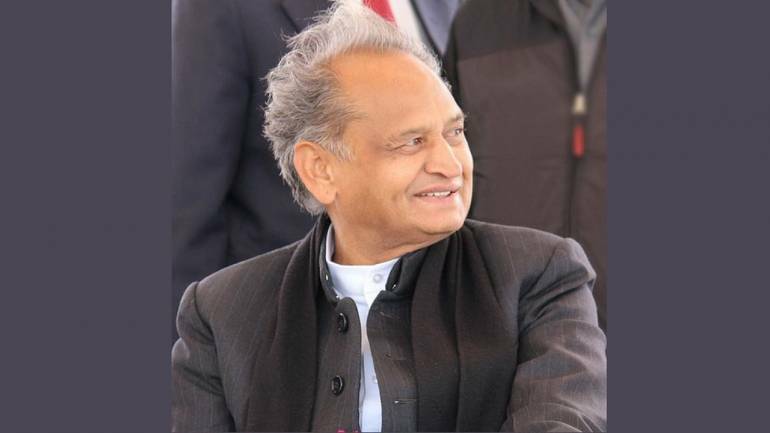 Considered as a leader with a personal connect with leaders across the state as well as mass acceptability across communities, Gehlot is reportedly being favoured for consolidating the electorate before the mammoth Lok Sabha elections. Rahul Gandhi is meeting Ashok Gehlot and Sachin Pilot at his residence. Congress president is trying to break the deadlock over CM post. This is the third time, Gandhi has called a meeting. Rahul Gandhi is meeting Ashok Gehlot and Sachin Pilot at his residence. Congress president is trying to break the deadlock over CM post. This is the third time, Gandhi has called a meeting. Pilot, 41, is still reported not on board on Gehlot's name, which is delaying the announcement, the sources said. The PCC chief has put up a stiff resistance and his staking his own claim for the top post. 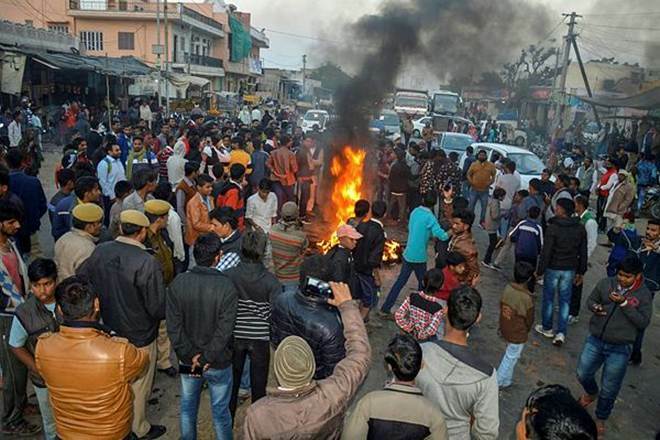 The incidents of violence were reported in Jaipur, Dosa and other parts Thursday following which the Congress leadership asked both Pilot and Gehlot to issue appeal for peace. AICC general secretary in-charge of Rajasthan Avinash Pande told PTI,' Congress president heard everyone and after wide consultations he will take the final decision which will be acceptable to all.' The Congress leadership want Gehlot and Pilot to be present together at the CLP meet. Sources said the Congress top brass was upset with the manner in which party workers resorted to arson and violence in the state in a bid to exert pressure on the party to name Pilot. Meanwhile, on delay of announcing the CM, Ashok Gehlot said, "decision is not being delayed, BJP is spreading lies. BJP took 7 days in UP & 9 days in Maharashtra to choose a CM.The process takes time,observers go to sates for discussion.Whenever such decision is taken it takes time, ANI quoted veteran Congress leader as saying. After several rounds of discussions that lasted till Thursday midnight, veteran Gehlot has emerged as a front runner for the top post. Gandhi Congress president Rahul Gandhi is likely to hold a fresh round of discussions Friday with Ashok Gehlot and Sachin Pilot at his residence in attempts to broker peace. 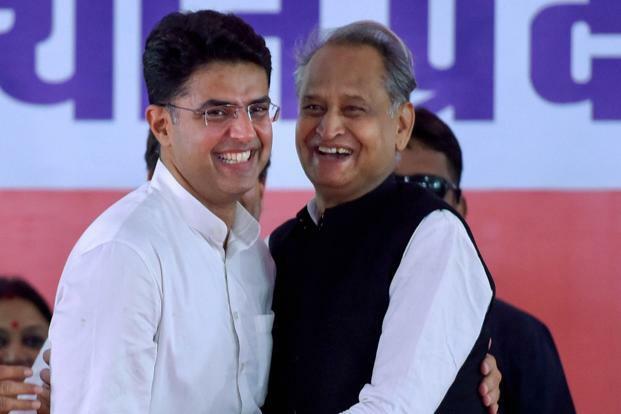 The decision of Rajasthan's next chief minister is likely to be taken before noon and will be made public at a meeting of the Congress Legislature Party (CLP) in state capital Jaipur, news agency PTI reported. Security has been stepped up in Jaipur ahead of the likely announcement of the Chief Minister's pick for the state. Rajasthan Police has deployed a number of personnel across the city to prevent any untoward incident. This comes after supporters of Sachin Pilot resorted to violence and blocked roads amid indications that Ashok Gehlot was ahead in the race for CM. Drones have also been deployed to keep a watch. The poster war that broke out between the Sachin Pilot and Ashok Gehlot factions may be heading for closure. Posters congratulating Gehlot for being appointed Chief Minister sprang up across state capital Jaipur as well as at Gehlot's residence. Earlier, supporters of both factions had put up posters of their favourite leaders soon after the results were declared. Rajasthan CM race: Rahul Gandhi to announce CM by 11 AM? Congress president Rahul Gandhi may take a final decision on Rajasthan CM at around 11 AM today. The decision is likely to come after a meeting with Sachin Pilot who has left his residence to meet Rahul. As per TV reports, the decision could come anytime after 11 AM. In Jaipur, supporters of both Pilot and Gehlot gathered outside their homes on Thursday. “Looking at the number of supporters, additional policemen had to be deployed,” police said. According to The Indian Express report, supporters were camping outside Pilot’s residence since morning. “It is not acceptable to us if someone reaps the reward of someone else’s hard work. We believe in Pilot sahab. He transmitted a new energy across youths of the state,” said one Pilot supporter. Congress' Rajasthan observer, KC Venugopal, had said that a final decision on state's CM will be conveyed on Friday morning. While the Congress has gone to great lengths to give out the impression that there is no infighting over the Chief Minister's post, the camps of Sachin Pilot and Ashok Gehlot have been at loggerheads with each other on the matter. Sources say that the decision has been stuck since Thursday as Pilot has refused to relent. As per reports, Rahul Gandhi had offered Pilot the deputy CM's post but Pilot refused to accept it. With Pilot having dug in his heels, the decision becomes all the more difficult for the Congress president who is faced with a problem of plenty. As the Congress leadership in Delhi deliberated over the chief minister's post, groups of people tried to stop traffic at places in Dausa, Ajmer and Karauli districts. Protesters blocked the Jaipur-Agra highway at Dausa for some time, burning old tyres. There was a similar disruption on the Jaipur-Ajmer highway, and attempts to block traffic on other roads. In most cases, the protesters were from Pilot's Gujjar community, police said. 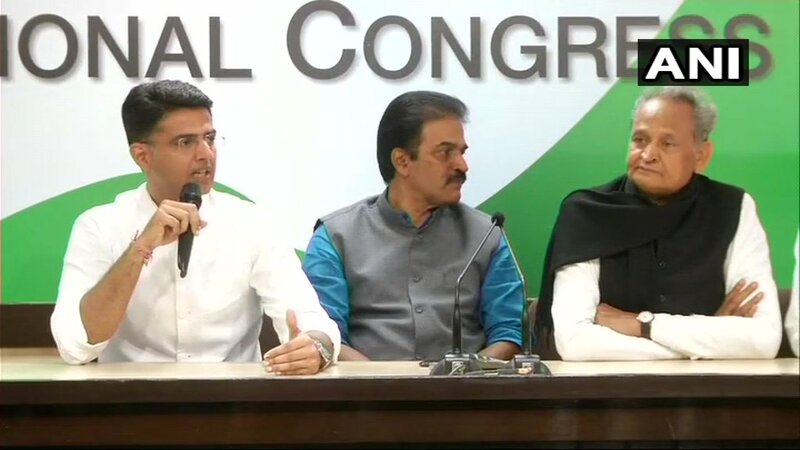 AICC in-charge of Rajasthan, Avinash Pande, told PTI: "We have given a detailed report on the views of party MLAs to the Congress president, who will take a final call on chief ministers. The decision will be announced at the legislature party meeting in Jaipur." 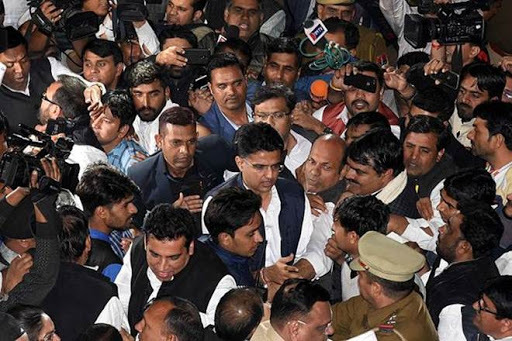 In the wake of reports of incidents of violence in various parts of Rajasthan, allegedly by his supporters demanding his appointment as chief minister, Sachin Pilot on Thursday appealed for peace and ensure discipline. "I appeal to all party workers to maintain peace and discipline. I have full faith in the Congress leadership. Will welcome whatever decision party chief Rahul Gandhi and Sonia Gandhi will take. We all have a responsibility to maintain dignity of the party," he said in a tweet. 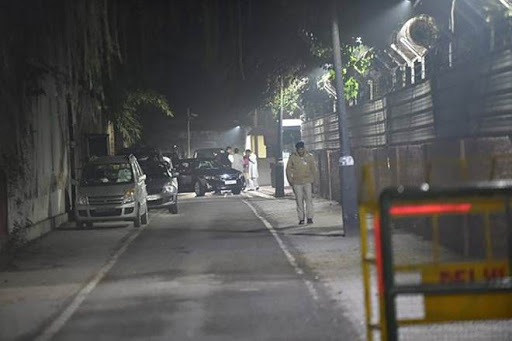 Sachin Pilot had reached Gandhi's official residence in Lutyens Delhi for a second time late on Thursday night. Soon after Pilot left, Ashok Gehlot also reached the Gandhi residence again, as the party leadership continued to discuss the claims by the two leaders for the top post in Rajasthan. Pilot's supporters also shouted slogans in his favour outside Gandhi's residence in Delhi. While Gehlot is learnt to be leading the race for chief minister's post, Pilot is also putting up stiff resistance and is staking his claim. Gandhi held a late evening meeting with party's central observer Mallikarjun Kharge, who said that further deliberations will take place tomorrow with state leaders before arriving at a final decision on chief minister. Congress president Rahul Gandhi has deferred the decisions on chief ministers of Rajasthan and Chhattisgarh for Friday as he wants to hold further discussions with party leaders, Congress sources said. Jaipur: Congress workers and supporters celebrate after the party's victory in Rajasthan Assembly elections, at party office in Jaipur, Tuesday, Dec. 11, 2018. (PTI Photo) (PTI12_11_2018_000252B)Rahul Gandhi has concluded his meeting with Pilot and Gehlot again at his residence in attempts to broker peace, like he did in the case of Madhya Pradesh. Moreover, even as Gandhi is yet to take a final decision on Rajasthan CM, posters congratulating Gehlot for being appointed Chief Minister sprang up across state capital Jaipur as well as at Gehlot's residence. As per media reports, Ashok Gehlot has been picked as the Chief Minister. 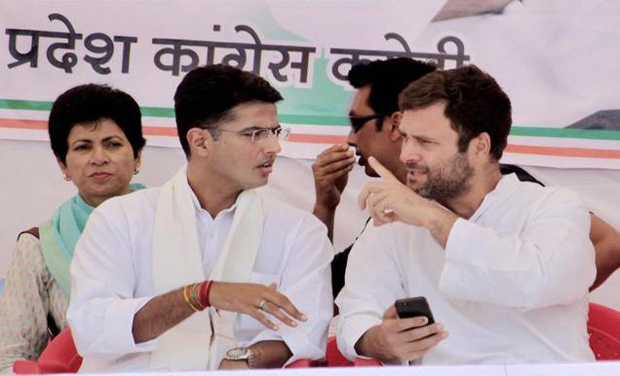 What role Sachin Pilot will have in the state or he will move to the Centre is still unclear.